Michelle Dortignac, founder of Unnata® Aerial Yoga, is a certified Yoga instructor of over 20 years, while during most of those years also being a professional aerial acrobatics performer. Michelle Dortignac is a life-long movement artist who founded Unnata® Aerial Yoga in 2006 from the synthesis of her passion for aerial acrobatics, and deep reverence for Yoga. She is a Master of Aerial Yoga who has trained many of the Aerialists and Yogis offering teacher trainings today. Through her continued devotion to the evolution of Unnata Yoga, Michelle has grown the method from a playful way to practice yoga in a spare bedroom in her home (before anyone had even heard of Aerial Yoga! ), to a worldwide phenomenon with teachers in over 30 countries. And yet, she remains a dedicated student to the humbling lessons her practice consistently delivers. Michelle leads every aspect of the Unnata organization, with steady guidance and visionary direction, and an abiding respect for its teachers and students. She continues to train teachers throughout the world in a precise, and purely Yogic Aerial Yoga methodology. Then she returns home to teach private and group classes in NYC. In the 20+ years that Michelle has taught Yoga, she has studied with many great Masters, who continue to inform her teaching and personal practice, and the evolution of Unnata Aerial Yoga. Legendary Sri Dharma Mittra has taught Michelle for over 15 years, and in 2018, she earned 500-hour certification in Dharma’s extensive Life of a Yogi TT program. She also studies regularly with Yogiraj Alan Finger and was initially certified in Vinyasa Yoga in 1998 at the OM Yoga Center, NYC by Cyndi Lee. Through all of the books, conferences, workshops and trainings she’s absorbed over the years, it’s Michelle’s personal practice since 1991 that has been the foundation for a life of Yoga. In 2002, Michelle ran away and joined the circus. Well, not exactly. But she did transition a successful Dance career from the floor to the air, when she took up the circus art of Tissu, or Aerial Silks. Michelle co-founded Suspended Cirque, New York City’s original resident theatrical aerial arts troupe, and performed across the city for years. Unnata Yoga arose as an organic expression of Michelle’s aerial artistry: she slipped her extensive Yoga training into the folds of the aerial fabric, and a new practice of Yoga was born. As Michelle shared her creative discovery with her Yoga students and aerial colleagues, Unnata Aerial Yoga flourished like a seed whose time was ripe. Ultimately, Michelle withdrew from the world of aerial theater to engage her full focus in the Yoga method she founded. As a child growing up in Colorado, Michelle hiked and camped and contemplated the silent expanse of the wild Rocky Mountains. In reaching toward those peaks, she ignited the spark of strength, endurance, and flexibility that later led to a lifetime of physical artistry through movement, and she touched into the truth of seeking silence within. The art of Unnata Yoga emerged from a professional aerialist, and yet it remains pure Yoga at heart. Grounded in Yogic wisdom, and connected to an authentic tradition, Unnata Aerial Yoga inspires a fresh perspective for an ancient practice. It’s one of the original methods of Aerial Yoga, but by classic Yogic standards, Unnata Yoga is still in its infancy. Still, Michelle propels the evolution of Unnata Aerial Yoga, both as a method, and as an organization, even as she endeavors in her personal process of Yogic awakening. Learn more about Dharma Mittra’s Yoga center. Learn more about Michelle’s former aerial performance troupe, Suspended Cirque. See Michelle and students share their personal connections to the Unnata Aerial Yoga method, and the difference it has made in their lives: What Makes Unnata Aerial Yoga Special?. 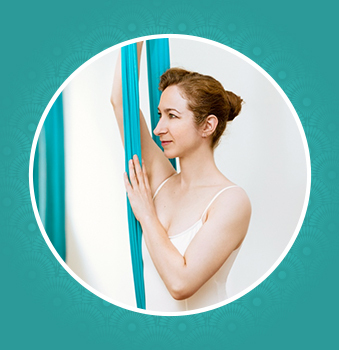 Michelle teaches weekly Unnata® Aerial Yoga classes at the Sacred Sounds Yoga center in New York, NY. Additionally, she leads specialty workshops and teacher training courses around the world. Stay for FREE Pranayama/Meditations after all classes! Visit Sacred Sounds Yoga Schedule for more details. Private, semi-private, and private group classes can also be scheduled. Please contact: [email protected] for availability.